When I was a child Archbishop Mannix came yearly to a local church fete. Through his speeches ran two recurrent themes. One was the wrong suffered by Ireland at the hands of the English; the other was that suffered by Catholic schools at the hands of the Australian government. Decades later, in the days of Brexit and Gonski, the same songs are being sung. Why this is so deserves reflection. 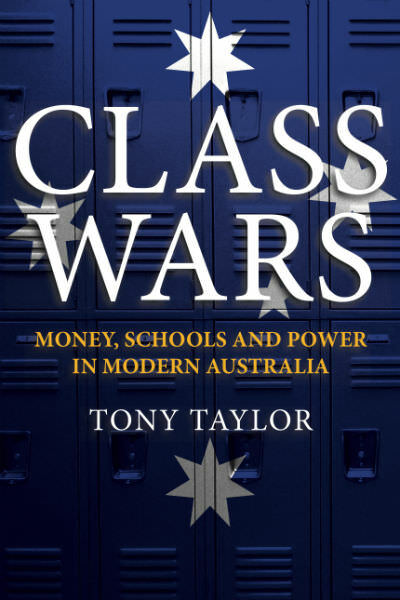 Class Wars: Money, Schools and Power in Modern Australia, Tony Taylor's superb study of the funding of Australian schools from the time when Menzies first aided Catholic schools until today, explains how school funding has come to pose such an intractable problem for governments. It is also a lament for so many lost opportunities to build an educational framework that would open opportunity to all Australians, especially the most disadvantaged. Taylor identifies the elements that have complicated decisions about school funding. It has involved many mutating conflicts. The Catholic decision to establish its own schools without public funding took place in a poor and minority church where most Catholics were of Irish descent, and regarded the government schools as de facto Protestant. Many of those who opposed the funding of Catholic schools, too, were secularist in their philosophy. After Mannix took a strong stand against conscription, sectarian divisions made any discussion of state aid bitter and unproductive. Catholic schools got by through Catholic sisters and brothers' gift of their lives. But Catholics resented what they saw as the injustice of it all. By the 1960s the social division between Catholics and others had lessened; children of the baby boom had put huge pressure on all kinds of schools; Catholic schools now needed to pay lay teachers; the educational curriculum was increasingly seen as inadequate. The advocates for government, state and Catholic schools were becoming divided by a common appeal for justice. Catholics believed that parents had the right to government aid for educating children in schools of their choice. Social activists, especially in the ALP, believed that justice demanded giving priority to the underprivileged. Defenders of independent schools claimed that justice demanded support for aspiring parents who sent their children to good schools. The Goulburn Catholic School strike in 1962 focused attention on this multifaceted crisis. Soon afterwards the Menzies government provided funding for some science facilities and some scholarships in all schools. In contrast to those who see this simply as a response to Catholic need revealed in the Goulburn strike, Taylor argues persuasively that Menzies saw it as an occasion to neutralise the Catholic vote and also to support the independent grammar schools that educated the children of natural Liberal Party voters. "It is difficult not to share his anger that Commonwealth government education funding has increasingly benefited those already favoured rather than the disadvantaged." These two desires were expressed also in subsequent decisions about Commonwealth funding made by the Coalition government. They wedged the ALP, whose executive was locked into total rejection of funding for any but government schools. These goals also guided later Coalition governments, most notably through the strategic thinking of John Carrick and the ideological zeal of David Kemp. Howard's assurance that no one would suffer as the result of any changes has locked in the policy. The success of its policy can be seen in the relative growth of schools and funding going to the different kinds of schools: in the years of the Howard government, for example, the recurrent funding of independent schools rose twice as much as that of government schools. Whitlam, Hawke, Rudd and Gillard, who tried to address the needs of the most disadvantaged students and to introduce independent adjudication of funding, were hampered by ideological differences within the party and by ineffectual administration. They also faced strident criticism in the name of traditional values of curriculum changes and innovation. This introduced a further polarity between innovation and tradition to complement that between Catholics and Protestants. Gillard did ease through Parliament the Gonski reforms based on sector blind funding based on need. The Coalition, which initially bitterly opposed it, later co-opted it in a watered down form. It had won general support but was heavily criticised by some Catholic leaders for its perceived unfairness. Taylor tells this complex story well. It is difficult not to share his anger that in a society in which the welfare of individuals and the good of society depend increasingly on access to good education, Commonwealth government education funding has increasingly benefited those already favoured rather than the disadvantaged. It has proved impossible to create equal opportunity for all children in our school systems. It is easier to see why this been so than to imagine it being changed. That would require bipartisan support for a policy in the face of deep and mutating ideological divisions. The Catholic school system was founded to implement a Catholic as distinct from a secular vision of education, the latter being default protestant in colour. This debate later opened a further conflict between socially conservative and socially reformist views of education, and between meritocratic and needs based approaches to funding. The division was further entrenched by the effective advocacy arms of each school system, each fortified by a strong sense of the justice of its cause and armed with supporters to enlist. As any umpire knows, it is easier to control a football game when there are two teams on the field than three. When one is excluded it can play a spoiling game in the hope of playing itself back into the game. As a result any proposal for needs based funding administered by an independent body was watered down by a thousand amendments and qualifications by weak governments. Another effective obstacle to change was the promise by the Howard government that no one would be worse off in any change to an existing system biased in favour of independent schools. Such a promise has become de rigeur in almost any controversial change at election time, and is generally adopted by the opposition. It naturally leads to paralysis in policy, because any change to a more just society must entail winners and losers. Governments that have recourse to it abandon their service of the common good. Behind the funding question lie deeper questions about education itself. The focus on funding leads naturally to the assumptions that the important educational questions are economic, that the point of education is to prepare people who can contribute to economic growth, and that the only evidence relevant to educational success is quantitative. Many of those who focus on values in education may also oppose need-based funding, but their concern for values is legitimate. We should all be concerned to ask what kind of society our education system encourages. Finally, the focus on education funding can encourage the assumption that increased funding will of itself address inequality of opportunity. It will certainly have good effects. But many factors contribute to educational disadvantage and so to its alleviation. They include parenting, articulacy and interest in ideas in the home, early childhood learning programs, peer group pressures and social stratification dividing schools from one another. Many flow from inequality in society. If inequality is not addressed as a priority, public support for needs-based funding will drop and its effectiveness will be compromised. The Politicans should give school money to the schools public and private to the poorest electrates only. WHy does the electrate of Bradfield schools public and private need more funding or Wentworth electrate and Sydney electrate. What about poorest electrate of Durack in Western Australia or say Gorton in Victoria. It's extraordinary that somebody can make sweeping generalisations about school funding without giving any numbers or data to back them up. It's claimed that "...Commonwealth government education funding has increasingly benefited those already favoured rather than the disadvantaged." Really? Is that why non-government schools educating students from the highest SES families attract only 20% of the SRS base amount in government funding, while those educating students at the other end of the scale attract 90%? And ALL government schools receive 100% of their SRS funding from taxpayers and can keep what they praise privately on top (millions in some cases). All schools also receive additional government funds specifically based on disadvantage - so if you have none, or very little, you don't get much. A crucial historical factor in the funding of private schools were the demographic changes to the makeup of the Australian population in the 1950s and 1960s. A combination of the post-war baby boom and waves of new immigrants meant that there was a sudden increase in children in the population and public schools struggled to keep up with the demand for places. The easiest way to ease pressure was to partially fund students placements in private schools. The title "Class Wars" brings up memories of Politics, Catholics and Education in Melbourne in 1950s/60s. My father, an Irish catholic part-time trade union official, suggested to his PP that one way to embarrass the state government into helping finance non-government schools was for the parish's pupils to attempt to be enrolled en masse at the local state school. He was overruled. Such 'direct action', he was told, would play into the hands of the Communists, split the ALP, and the Victorian government might just call our bluff. Five years later in July 1962 seven Catholic schools in Goulburn took this direct action over funds for a toilet block. PM Menzies didn't supply federal funding right away but the Liberal-Country Party government drip-fed Catholic education for another decade until Gough Whitlam, despite threats of expulsion, saw the ALP had to drop its opposition to federal government funding and so won the 1972 election. Sectarian rivalry may have abated (debatable?) but the hard reality for politicians (or their expert advisers) is to find answers to the perennial questions: Who gets what, when, how and, the hardest, why? The Gonski reforms are not “sector blind” or “based on need”. They are the Howard government’s socio-economic status funding model renamed “capacity to contribute” and fund students not according to their individual needs but according to the socio-economic status of the neighbours of the students in the school. A school that wants to take both middle class and poor students will not be able to because the presence of middle class students will cut its government funding and thus push its fees up and thus drive out the poor, who will end up in the local government school. This is why they are particularly bad for Catholic parish schools that set their lows low to enable all families to attend, irrespective of the wealth of the local community. The public funding of non-government schools is standard practice throughout the OECD; e.g., Finland fully funds non-government schools at $US9,266 per student, compared with Australia at $6,137 (OECD Education at a Glance 2015, Table B3.3). The public funding of non-government entities, such as doctors, pharmacists, bus companies, childcare centres and kindergartens, is standard practice throughout Australia and not in the slightest controversial. Taylor's book blurb says: "The 2012 Gonski Review, urging all jurisdictions to move towards consensus on a needs-based and socially-just education system, has continued to encounter forms of political obstruction." As Chris Curtis illustrates, both Gonski I and 2 are hardly on the side of the angels when it comes to social-justice. Indeed, Gonski's recommendations for improving the curriculum suggest that he should have conserved his energies on a continued refinement of his funding recommendations and left curricular matters, about which he has no expertise, to educators. Missing from Andy's and Taylor's work is any reference to the shocking disenfranchisement of Australian Catholic schools from public funding for nearly a century, prior to which they were publicly funded! Not even the USA (where secularism is enshrined and, paradoxically, fundamentalism too) actually disenfranchised Catholic schools in that country from public funding, since they inherited no precedent for publicly funding Catholic schools. The Bishops' funding strategy is plainly in tatters. They should respond, as the Church teaches, by leaving Catholic independent schools to provide for themselves, and pursue a policy of fee-free integrated Catholic schools as have greatly advantaged NZ and all the OECD, with guaranteed freedoms for religious ethos and education. Dr Furtado: " . . . pursue a policy of fee-free integrated Catholic schools . . .with guaranteed freedoms for religious ethos and education." What is the basis for your confidence that such freedoms for religious ethos can be guaranteed and implemented in the Australia's currently and predominantly secular ethos? The primary basis for my confidence that such freedoms for religious ethos can be guaranteed and implemented is that they do already exist in all other OECD polities under circumstances negotiated by the Catholic Church largely on the basis of precedence arising from the fact that Catholic schools (or schools auspiced by the Catholic Church) were incontestably the first providers of a school education for children long before secularists, humanists, the state itself and various other providers entered the field. By way of contrast, in Australia Anglican schools handed over their school authorities to the state - evidenced by the fact that several state schools still use a crest with a mitre on it - especially under the jurisdiction of Bishop Broughton, who stated that he would rather religion be abolished from state schools than countenance an arrangement that would accommodate the Church of Rome. Secondly, when I presented a copy of my doctoral thesis to Premier Bligh of Queensland she stated that she saw no constitutional problem with transferring responsibility for funding all schools, secular and religious, from the Commonwealth to the states. (See Bligh's ANZSOG Address, Brisbane Hilton, 2006). Funding trends invariably respond to non-statist, deregulatory, educational demand! State aid for students actually started because the DLP told Henry Bolte that it would recommend its preferences to the Country Party if he did not grant it and he looked at the numbers and realised he had to comply. In 1967, the Victorian government introduced per capita grants of $10 per primary pupil and $20 per secondary student for non-government schools. Prior to 2001, non-government schools were federally funded on the basis of their private income, mostly fees. In 2001, the Howard government changed the rules so that fees became irrelevant to the determination of funding and funding was based on how well off the students’ neighbours were. This socio-economic status model was so bad for non-government schools that those damaged by it, half of them, were allowed to stay on Labor’s educational resources index model, the actual needs-based one, for which they were routinely and falsely labelled over-funded. In 2012 the Gonski panel endorsed the Howard SES model and renamed it “capacity to pay”, leading to almost universal misreporting that we had a new “needs-based”, “sector-blind” model. The public education lobby, which had spent a decade attacking the SES model suddenly demanded its immediate implementation, and the federal Labor government decided to force all those schools still on Labor’s needs-based ERI model onto the Coalition’s not needs-based SES model. In 2017, the Turnbull government with the support of the Senate cross-bench and almost that of the Greens, who reneged at the last minute, changed the law to cut $17 billion from spending, most from government schools but about 20 per cent of it from Catholic schools. This was the worst attack on Catholic education in 140 years, 1872 being the year their funding was initially cut off in Victoria and similar years in other colonies. The Catholic sector wants the fees a school charges to be half of the method for determining public funding, with the income of individual families being the other half. The independent sector likes the present model because it puts no restraint on how much their schools can charge in fees. Neither is right. There are four obstacles to a rational and just funding model in Australia: The public education lobby, in particular the AEU, which failed to propose any funding model at all to the Gonski panel, which is obsessed with the fact that members of the public attend schools not owned by the government in sufficient numbers to ensure that they are supported and which is unable to recast the “public” in “public education” as “accessible to the public”; The systemic school authorities, particularly the Catholic ones, which fear that closer integration with the public education system will result in a loss of their particular ethos and that a future cost-cutting government will result in a loss of funding and a ban on their making up for that loss by increasing their fees; Governments, which see the private contributions to education costs as a saving to taxpayers and which therefore are happy to see the CEOs become in private taxation authorities even though this privatisation of taxation adds to social segregation; The media, whose inability to report accurately on the various funding models we have and have had means that the public does not have a clue about the real issues. My last point is that we would have solved this problem six years ago if the Gonski panel or the Labor government of the day had accepted my submission, which based funding on an explicit staffing formula and allocated it to schools on the basis of their private income: the most money for free schools, the next most for low-fee schools and the least for high-fee schools, the aim being to reduce educationally damaging social stratification. Instead, we continue the mess of 140 years. The poor judgement of the Turnbull government has created the opportunity for the low-fee schools, particularly Catholic systemic ones, to reach a new settlement on the vexed issue with the Labor opposition. The New Zealand model, as mentioned by Micahel Furtado above and in place for 40 years, is one worthwhile approach. While there are some straws in the wind, whether that sector or that party will be bold enough to forge a new settlement is uncertain. Thank you, Chris. I think it instructive that ES, with its own evidently divided loyalties, i.e. an interest in social justice, a critical commitment to the shambles that is now Catholic educational funding policy in Australia, and a presumed fondness for Jesuit schools, which are among the most expensive and therefore exclusive in this country, has not approached either you or me (both of us foremost among those qualified to speak as well as published across Australia on the Catholic schools funding question) to write a piece proposing new Catholic educational funding policy guidelines that its readership and, presumably, the tight-lipped membership of the NCEC might read and comment upon even at this late stage of the forthcoming triennial funding allocations dilemma. Michael, I would not expect anyone to approach me to request an article as I am just a citizen with an interest. You, however, are an academic with research in the field. I wrote an article on this topic in 2011, before the Gonski report was released. The acting opinion editor of The Age said he would publish it on Tuesday, 22/11, and went so far as to sent a photographer all the way to my house, which is not only outside the inner suburbs but also outside the metropolitan urban growth boundary, on the Monday evening. The article did not appear. I was told the real opinion editor had come back and bounced it. No other publication would take it on. I tried again earlier this year with another article. Again, no one will publish it. I have written thousands of letters to the editor, emails directly to journalists (hardly any of which are answered), submissions and blog posts. Nothing makes any difference. I cannot get the media to correctly report the funding model we have or those we have had. The “needs-based”, “sector-blind”, “overfunded” mantras are just repeated in article after article. Chris, please send me a draft. You know my contact details. I shall attach or blend it with my research employing the usual attributions and then submit it to ES for publication. Let's see what happens next. I might suggest that our focus should be what's wrong with Gonski Mark II for Catholic schools and then enlarge upon an alternative Catholic school funding model that ES readership, at both local and episcopal levels, might consider and respond to us about through the good offices of ES. Its worth a try. Michael, Thank you. I will send you both articles shortly.